What’s it like to be a teenager today? On Saturday 24 March, the people of Wokingham and Bracknell will get to look inside their young people’s world at the Inside Out exhibition. 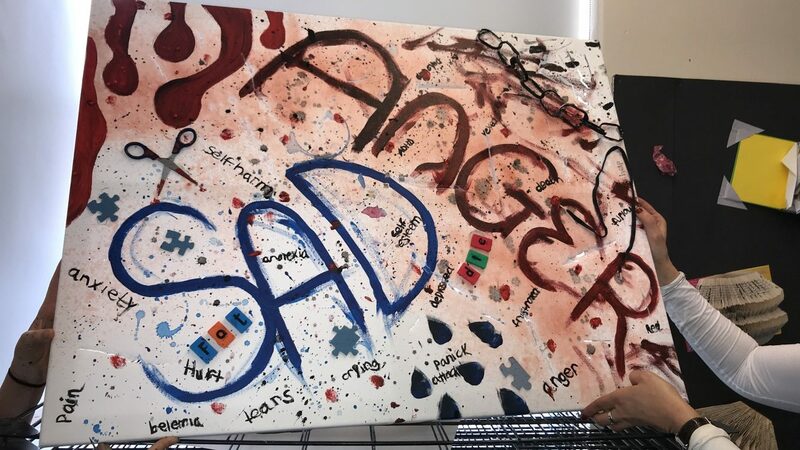 It’s the culmination of our Inside Out project, where hundreds of young people have been exploring and discussing mental health, stress and wellbeing and expressing their thoughts and feelings through art. You can read more about the project here. This year’s young participants have put together an impressive, thought-provoking and often humorous collection, using photographs, paintings, sculptures and even body art (drawn onto a live person!) to express their thoughts about the pressures their generation is under. With mental health problems sadly on the increase among teenagers today, it’s really important that we take the time to stop, talk and listen to young people about the pressures they face and how they can best react to them. Our director, Jane sums it up: “Our teenage children, grandchildren, nieces and nephews are living with high levels of stress. We see report after report about increasing rates of depression and anxiety in young people, along with self-harm, eating disorders and other serious symptoms. But it can take a year for a young person to get help through CAMHS. If you know and love a young person, come to their exhibition, see the impressive art they’ve produced and hear what they’re saying about their lives. The Inside Out exhibition takes place on Saturday 24 March, 2pm – 4:30pm, at Garth Hill College, Bull Lane, Bracknell RG42 2AD. Admittance is free and everyone’s invited.